At Computex 2015 Intel released the new Intel Xeon E3-1200 V4 lineup. The Intel Xeon E3-1200 V4 series is based on the Broadwell microarchitecture. It is also the first generation Intel Xeon E3 series based on 14nm process. Perhaps the most interesting insight from the launch is the positioning of the Intel Xeon E3-1200 V4 series. Previously, the Intel Xeon E3-1200 V1, V2 and V3 series have stood for the lower end compute segment. 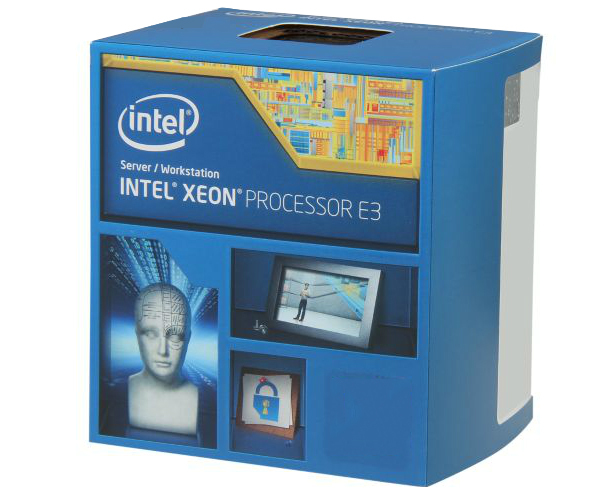 Traditionally, the Intel Xeon E3-1200 series has had a wide range of processors. Today Intel is announcing only 5 SKUs. The new V4 series is lower end compute but also is being heavily touted for its GPU parts. The new Intel Xeon E3-1200 V4 series has Iris Pro based P3600 embedded. This finally provides a more passable GPU for low end workstation graphics. Whereas previously, the Intel Xeon E3 embedded graphics on E3-12×5 based SKUs was still rather slow, Iris Pro is a significant leap forward. Intel is citing HD video streaming (via Quick Sync) as well as VDI/ remote desktop applications as a key driver for this focus on graphics. The Intel Xeon E3-1200 V4 series consists of 5 Broadwell based SKUs. Four of the five had 128MB of eDRAM embedded for faster integration and performance. 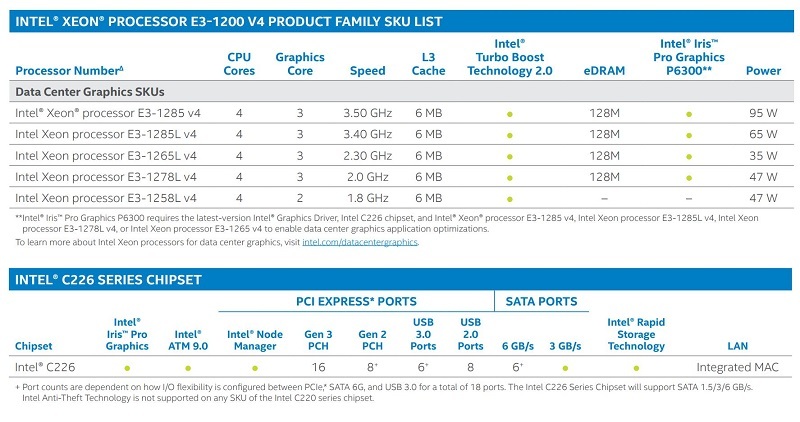 The Intel Xeon E3-1258L V4 does not have Iris Pro and does not have the 128MB of eDRAM. Interestingly, even with the lowest clocks and without Iris Pro P3600 graphics it still commands a 47w TDP. Since these V4 SKUs all have GPUs, the only supported chipset is the Intel C226 chipset. Although it does offer remote management via Intel AMT, that is a much less well supported standard than IPMI in many OSes. For example, many/ most fencing schemes include support for IPMI, however few include support for Intel AMT. Intel AMT is supported by some applications such as Ubuntu MAAS, however it does not have the same widespread server support. Intel has made it clear: if you are looking for lower-end compute right now Intel Xeon E3-1200 V3 is still a decent option as clock speeds can easily scale beyond 3.5GHz of the Intel Xeon E3-1285 V4. Realistically though, Intel is positioning the Atom C2000 series (and its successor late this year) and the Xeon D series as the lower-end compute segment options, at least until we see the Skylake Xeon E3-1200 V5 chips arrive. We confirmed Skylake Xeon E3-1200 V5 chips will support DDR4 ECC RDIMMs earlier so it seems Intel as acquiesced that Skylake is going to be the real Xeon E3 reboot. That is particularly disappointing as the Intel Xeon E3-1280 V3 was released in 2013 with higher clock speeds than the V4 chips are two years later. Of course, the Xeon D is an extremely strong platform that is simply outselling supply at this point. What a bore of an announcement. Skylake in 3 months? > ” … if you are looking for lower-end compute right now …”. Who does that, low end GP Graphics (for ease of Management, and to save a Slot) makes sense, but who wants to ‘compute’ (run OpenGL) slowly. Better to have a beefier CPU, or other on-Chip Features. > ” The Intel Xeon E3-1258L … even with the lowest clocks and without Iris Pro P3600 graphics it still commands a 47w TDP. “. Probably a recycled / reclaimed Chip. With what Skylake is sure to bring to the Xeons, again I must wait (but the Xeon-D is also a favorite; what will Skylake bring to the ‘D’ ?). A great ‘Leak Article’ from WCCF Tech’s Website (that seems extensive and not far fetched) is here: http://wccftech.com/intel-skylake-launch-schedule-leaked-skylake-s-skylake-y-skylake-h-skylake-u-launch-september-2015/ . From Charts of Families to Lists of Motherboards; lots of interesting reading of unconfirmed rumors.